For over 800 years people have been coming to this sacred place to worship God and to meet one another. This historic medieval parish church of St Asaph, also known as Church of St Kentigern and St Asa (Asaph), lies at the lower end of the High Street in St Asaph. It is reputed that St Kentigern founded the church about 560 AD, with the dedication to St Asa (Asaph) being added in the mid-12th century. This site is the birthplace of the parish. The dedication, location and morphology of its churchyard is typical of an early medieval foundation. St Kentigern (also known as Mungo). Born 518 AD, died 603 AD. Parents: Owain mab Urien, Teneu. Like many of the churches in the Vale of Clwyd, its architecture consists of two parallel naves separated by an arcade. The church was originally built in the 13th century; it was recorded with the cathedral in the Norwich Taxation of 1254, but appears in a separate record in the Lincoln Taxation of 1291. The earliest fabric of the church dates from this century. The church was built to serve the parish, but probably represents the site of the pre-Norman Conquest mother church. The Church is thought to have been reconstructed on the old foundations in 1524 when new windows were incorporated and the structure was re-roofed with the present striking hammerbeams. The inscription dated 1614 on the chancel window in the south wall provides evidence that the south nave was reconstructed at this time; all the other stained glass windows are Victorian. The North nave was added at an unrecorded point later in the 16th century; this, too, has a hammerbeam roof. In 1629-30, the south porch suffered irreparable damage in storms and was rebuilt, and in 1687 a new south doorway was inserted. Its inner door dates to this period and bears the inscription – 1687 RR RI SI EI – presumably the initials of the men who worked here. The present porch, bellcote and vestry were added in 1872 under the direction of Sir George Gilbert Scott, the leading architect of the Gothic revival and architect to the dean and chapter of Westminster Abbey. During 1830 an organ was transferred from the local cathedral to the church, but this was later given to Llanynys church in 1901 when the organ from Llanrhaiadr (Llanrhaeadr) was installed in its place. This remains in situ and in good order; its fine tones can be heard during services. The polygonal churchyard is well-kept and extends mainly to the south where it provides a grand vista of the church; a segment of this area was surrendered for road widening in 1960. The churchyard was closed for burials in 1871. Its monuments have been re-sited during various times of adjoining highways reconstruction with many located around the perimeter and footpaths (CPAT 16955). In the south-west corner of the churchyard lies the grave of Dic Aberdaron (Richard Robert Jones, 1780-1843), a polyglot enigmatic Welsh scholar and tramp, who reputedly spoke 15 languages and who occupied himself during 1831 and 1832 by compiling his Welsh-Greek-Hebrew dictionary. A sundial stands in the south churchyard, which has a tapering circular stem approximately 1.2m high on a square base. It is claimed as possibly of 16th century origin in the 1987 Listed Building Schedule. 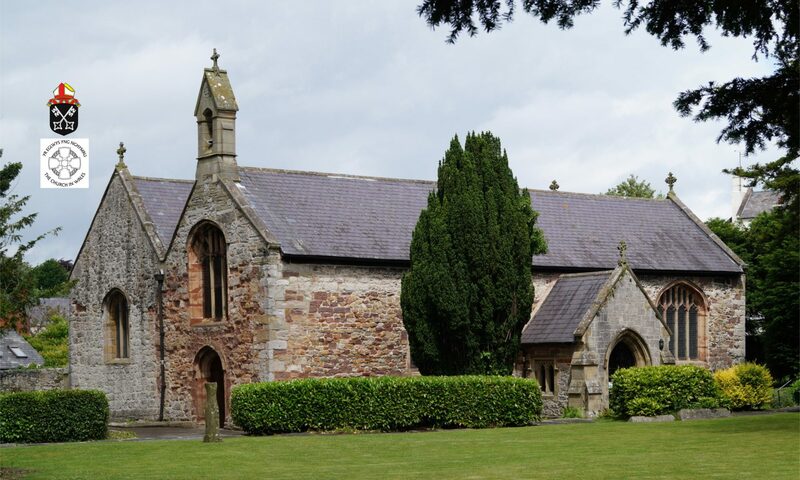 A record of burials of both the parish church and the Mount Road cemetery in St Asaph are kept in the parish church.